Once again the visitor numbers from the Sierra to the coastal community of Bahia de Caraquez have swelled significantly. The school year in the sierra is similar to the traditional North American school year with two months of vacation in July & August. Families from the Sierra love to spend their summer vacations on the coast. The streets have young people of all sizes riding motorcycles, scooters, and atv's. The school year here on the coast breaks for "summer vacation" in January & February. It is nice to see local business ( restaurants, stores ) bustling with customers, beaches crowded, and the water activity again on the estuary. 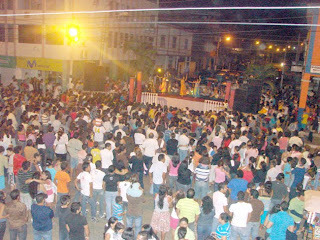 Now anticipated as one of the best forms of community entertainment is the 2010 Noches de Verano ( Nights of Summer ). 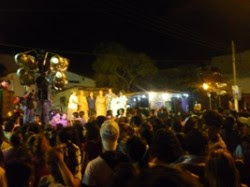 Held on six consecutive Saturday evenings in July and August in various downtown main street locations in Bahia de Caraquez. It is very well attended by thousands of residents and visitors. This is a family event with community clubs, schools, and churches selling cakes, food, and drinks. Each evening starts with a short parade down the Avenue of Simon Bolivar ( main street ) featuring community royalty, this night's festival selected queen, a local school marching band and dance troup, Disney characters, clowns and varied entertainment. A central stage features a formal program provided by the Municipality Tourism with a variety of entertaining artists , musicians, choreographed dance ensembles, cultural groups, folklore and comedians. Local youngsters compete as mini Michael Jackson and Elvis Presley, karaoke singers, and latin dancers. On the inaugural evening members of the Symphonic Band of the Municipal Government offered a complete repertoire of ballads, classic music, and boleros to the public's delight. Late in the evening ( shortly before midnight ) with the street vendor smells of BBQ meats, fresh popcorn, hot fruit alcohol punch, and spilt beer, a band and DJ take over to provide music for dancing in the streets. A fireworks display lights the tropical summer evening moonlit sky. The nights of summer program provides the business owners ( who all remain open ) with boosted economic benefits. Local merchants have contests and provide promotional gifts and prizes. Currently we have a Brazilian Circus in town. Well the other evening we had a circus side show in our own yard. Now that everyone has survived we have been asking others, and searching the internet in an attempt to identify this creature. 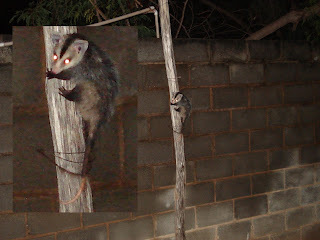 After numerous suggestions and reviewing photos it appears our visitor was a white eared, or a similar variety of opossum.